For more than 30 years, Adoptive Families has helped people find their way to family after infertility. Use our searchable directories of up-to-date adoption and assisted reproductive technology (ART) professional listings below, and get started today! >> Go to your Member Account page (note: you must be logged in to access this page). 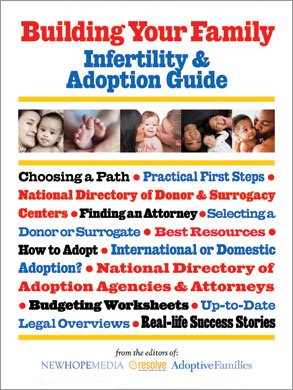 Scroll down to the section labeled “Your National Infertility & Adoption Directory Listing(s)” and you’ll see your active listing(s). Click the “Edit” button to edit your listing(s) at any time. *Use our downloadable worksheets as you interview prospective adoption or assisted reproductive technology professionals to compare them and make your decision.